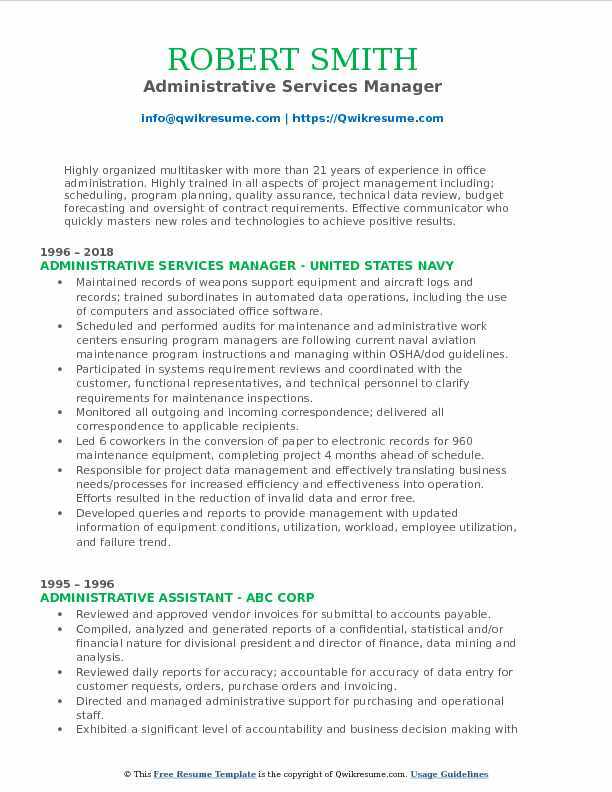 Administrative Services Manager is involved in planning, directing and coordinating the services of the business; they also support the organizational system in tasks such as recordkeeping, distribution, reception, telephone operation and various other such tasks that support the office system. At times Administrative Service Manager also gets actively involved and oversee facilities planning, custodial operations, maintenance and monitor the facilities to see that the operations remain safe, secure and organized. 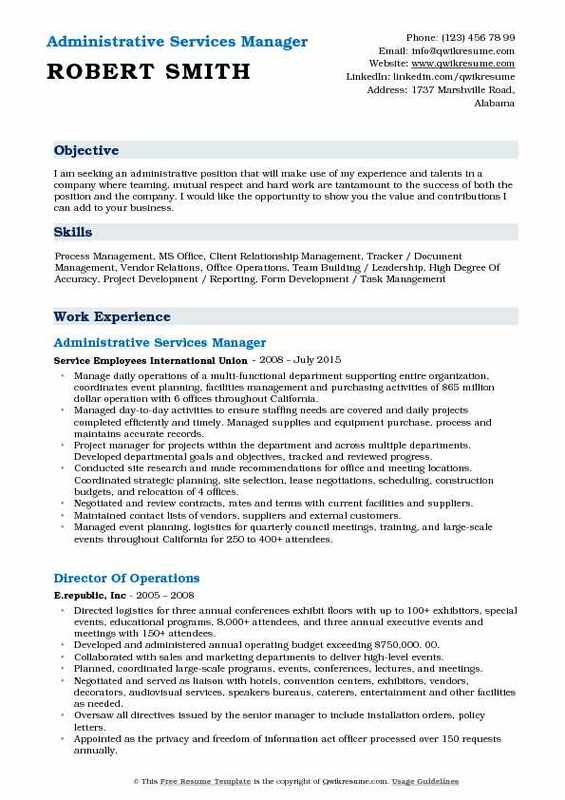 Those seeking this position need to demonstrate in the Administrative Service Manager Resume sample some important qualities such as analytical, communication, detail oriented and leadership skills. While a Bachelor’s Degree in business, facility management or engineering may be enough to become an Administrative service manager, a Post-Graduation in Business Administration may enhance the chances of these managers to advance further. Summary : Demonstrated capability to provide wide-ranging support (planning, directing, and coordinating operational activities) for executive-level staff including project scheduling, coordinating project details, and effectively and efficiently micromanaging all essential tasks and objectives. Proven history of accurately completing research, reporting informative management, and business-development efforts within budget. Support members of the executive staff by conducting research, preparing statistical reports, and supervising other clerical activities. Establish and implement departmental policies, goals, objectives, and procedures, conferring with board members. Maintain corporate bylaws, amendments, and yearly corporate shareholders meeting minutes. Preparation of quarterly sales tax returns, property tax reports and business license tax renewals. End-of-year account reconciliation and preparation of records for CPA review. Bookkeeping using QuickBooks/Quicken software, purchasing, accounts payable. Prepared applications and maintained renewals for minority or small business certifications from local, state and federal. 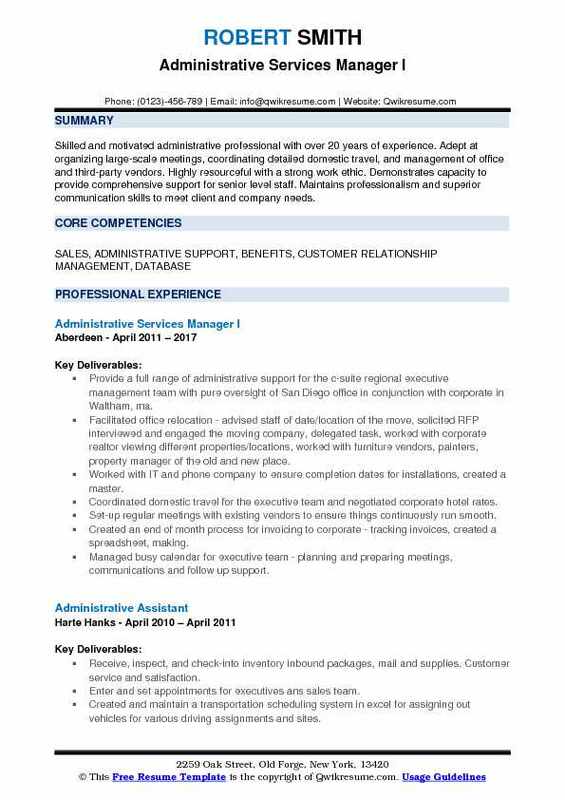 Headline : Skilled and motivated administrative professional with over 20 years of experience. Adept at organizing large-scale meetings, coordinating detailed domestic travel, and management of office and third-party vendors. Highly resourceful with a strong work ethic. Demonstrates capacity to provide comprehensive support for senior level staff. Maintains professionalism and superior communication skills to meet client and company needs. Provide a full range of administrative support for the c-suite regional executive management team with pure oversight of San Diego office in conjunction with corporate in Waltham, ma. Facilitated office relocation - advised staff of date/location of the move, solicited RFP interviewed and engaged the moving company, delegated task, worked with corporate realtor viewing different properties/locations, worked with furniture vendors, painters, property manager of the old and new place. Worked with IT and phone company to ensure completion dates for installations, created a master. Coordinated domestic travel for the executive team and negotiated corporate hotel rates. Set-up regular meetings with existing vendors to ensure things continuously run smooth. Created an end of month process for invoicing to corporate - tracking invoices, created a spreadsheet, making. Managed busy calendar for executive team - planning and preparing meetings, communications and follow up support. Managed the planning of all annual events, and sales meetings - site selection, hotel negotiation, onsite. Management, executing team building functions, budget and vendor management, speaker solicitation. Vendor management - created a detailed spreadsheet of dates/times of deliveries, monthly. Sales support - distributed incoming leads, managed customer relationship management database. Summary : Highly skilled, driven and enthusiastic Office Manager/Administrator professional offering extensive experience in office administration, project management, planning, leading, implementing and documenting all aspects of complex competing initiatives. A very effective communicator who builds exceptional teams and relationships with senior management, associates, customers and vendors. Head of office administration for an international, $1b, specialty chemical solutions corporation. Reported to SVP, member of regional business unit (RBU) leadership team, supervised administrative staff. 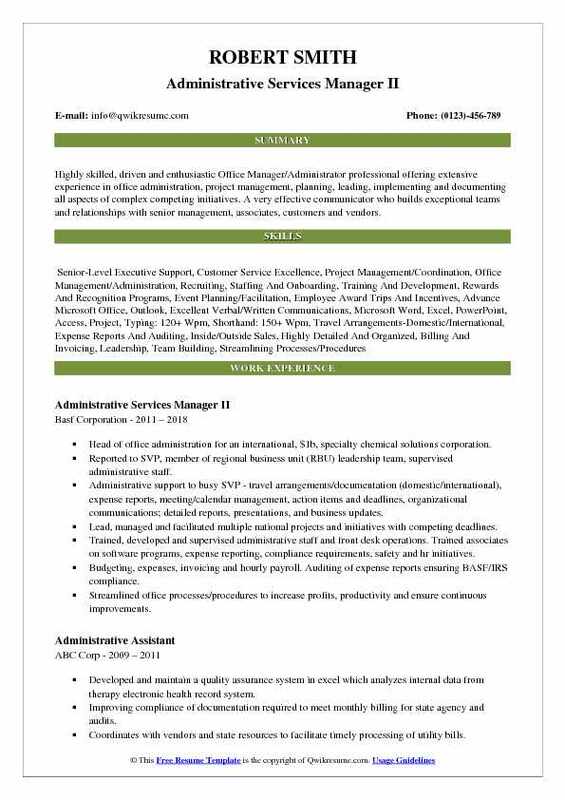 Administrative support to busy SVP - travel arrangements/documentation (domestic/international), expense reports, meeting/calendar management, action items and deadlines, organizational communications; detailed reports, presentations, and business updates. Lead, managed and facilitated multiple national projects and initiatives with competing deadlines. Trained, developed and supervised administrative staff and front desk operations. Trained associates on software programs, expense reporting, compliance requirements, safety and hr initiatives. Budgeting, expenses, invoicing and hourly payroll. Auditing of expense reports ensuring BASF/IRS compliance. Streamlined office processes/procedures to increase profits, productivity and ensure continuous improvements. Contract negotiations up to $300,000, vendor approvals and service commitments (1-5 year duration). Managed rbus corporate site audit process to ensure timely response and compliance (35 sites). Managed budget, services, and invoicing for on-site catering vendor at Beachwood headquarters. 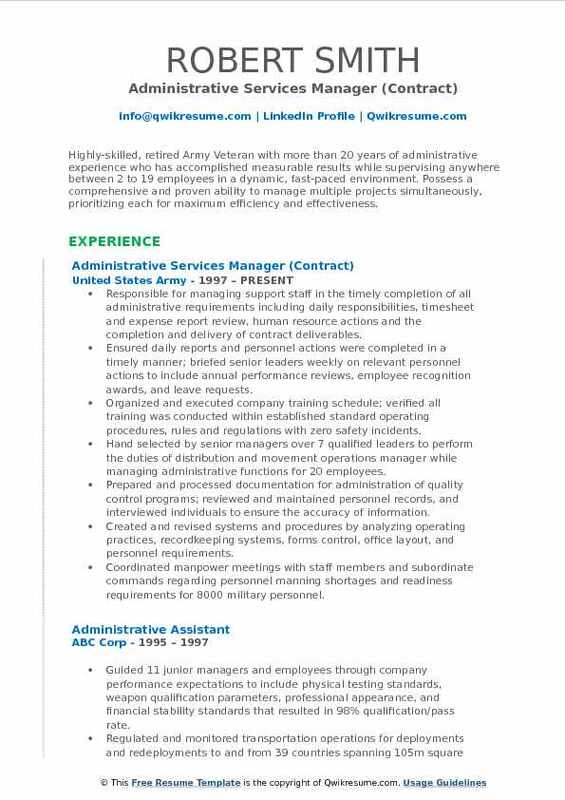 Summary : Highly-skilled, retired Army Veteran with more than 20 years of administrative experience who has accomplished measurable results while supervising anywhere between 2 to 19 employees in a dynamic, fast-paced environment. Possess a comprehensive and proven ability to manage multiple projects simultaneously, prioritizing each for maximum efficiency and effectiveness. Responsible for managing support staff in the timely completion of all administrative requirements including daily responsibilities, timesheet and expense report review, human resource actions and the completion and delivery of contract deliverables. Ensured daily reports and personnel actions were completed in a timely manner; briefed senior leaders weekly on relevant personnel actions to include annual performance reviews, employee recognition awards, and leave requests. Organized and executed company training schedule; verified all training was conducted within established standard operating procedures, rules and regulations with zero safety incidents. Hand selected by senior managers over 7 qualified leaders to perform the duties of distribution and movement operations manager while managing administrative functions for 20 employees. Prepared and processed documentation for administration of quality control programs; reviewed and maintained personnel records, and interviewed individuals to ensure the accuracy of information. Created and revised systems and procedures by analyzing operating practices, recordkeeping systems, forms control, office layout, and personnel requirements. Coordinated manpower meetings with staff members and subordinate commands regarding personnel manning shortages and readiness requirements for 8000 military personnel. Summary : Dedicated Administrative Services Manager adept at project, operations, administrative and procurement management dedicated to team and organizational success. Highly organized and industrious with great written, oral, interpersonal communication, critical thinking and decision making skills. Seeking a position within state government to utilize my leadership, analytical and public administration skills. Effectively and efficiently managed the administrative services of aspects of the health sciences executive office to include the office of the general counsel for health sciences. Presented through one on one meetings to senior leaders on rounding initiative for employee engagement and patient satisfaction. Managed the health sciences administrative professional development team (apdt) activities. Made recommendations in the areas of staff selection, disciplinary actions, complaints, staff performance appraisal and similar supervisory duties. Planned, assigned, and evaluated the work of subordinates for effective operation and results of the unit. Demonstrated sound judgment, financial skills, and understanding of business principles. Supervised and monitored the purchase of all day to day supplies and promoted productivity and cost containment. Collaborated with physicians, nurses, and other healthcare providers and stakeholders to develop and maintain a measurable excellent standard of patient care. 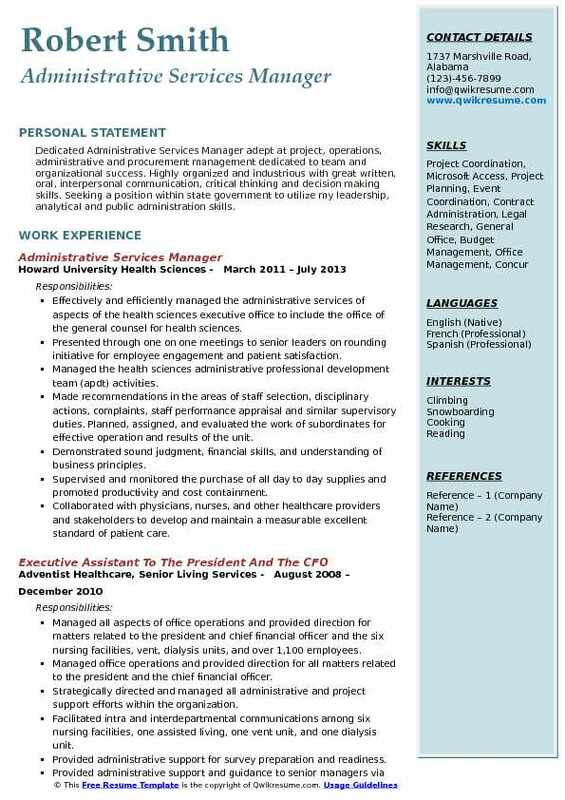 Effectively and efficiently managed the operations of the health sciences executive office. Supervised pre and post-meeting preparations for all health sciences major committee meetings. Served as liaison for risk assessment and accountability committee (raac); global business steering committee (gbsc); and compliance advisory and accountability committee (caac). Performed scheduling and calendar management for deputy general counsel. Participated in long-range planning and designs and implemented process improvement plans. Summary : I am seeking an administrative position that will make use of my experience and talents in a company where teaming, mutual respect and hard work are tantamount to the success of both the position and the company. I would like the opportunity to show you the value and contributions I can add to your business. Manage daily operations of a multi-functional department supporting entire organization, coordinates event planning, facilities management and purchasing activities of $65 million dollar operation with 6 offices throughout California. Managed day-to-day activities to ensure staffing needs are covered and daily projects completed efficiently and timely. Managed supplies and equipment: purchase, process and maintains accurate records. Project manager for projects within the department and across multiple departments. Developed departmental goals and objectives, tracked and reviewed progress. Conducted site research and made recommendations for office and meeting locations. Coordinated strategic planning, site selection, lease negotiations, scheduling, construction budgets, and relocation of 4 offices. Negotiated and review contracts, rates and terms with current facilities and suppliers. Maintained contact lists of vendors, suppliers and external customers. Managed event planning, logistics for quarterly council meetings, training, and large-scale events throughout California for 250 to 400+ attendees. Managed communication to effectively promote upcoming events, both internally and externally. 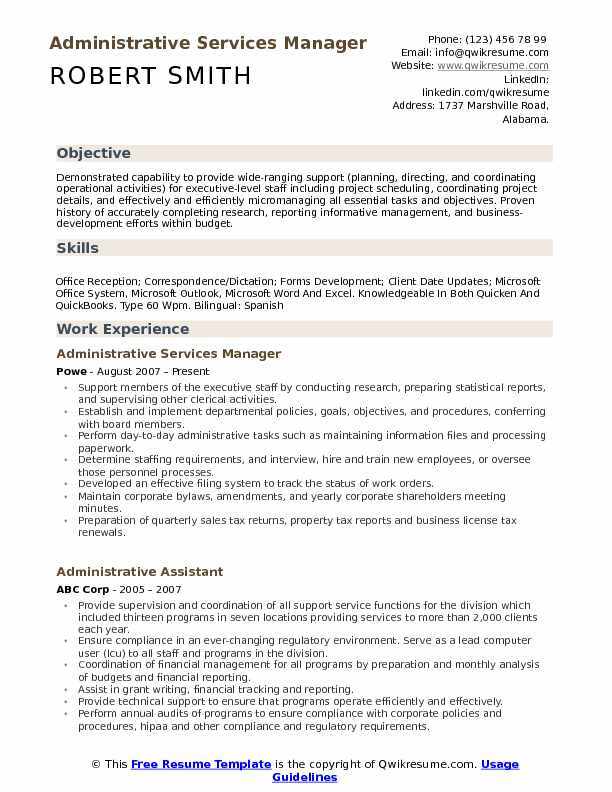 Summary : Highly organized multitasker with more than 21 years of experience in office administration. Highly trained in all aspects of project management including; scheduling, program planning, quality assurance, technical data review, budget forecasting and oversight of contract requirements. Effective communicator who quickly masters new roles and technologies to achieve positive results. Maintained records of weapons support equipment and aircraft logs and records; trained subordinates in automated data operations, including the use of computers and associated office software. Scheduled and performed audits for maintenance and administrative work centers ensuring program managers are following current naval aviation maintenance program instructions and managing within OSHA/dod guidelines. Participated in systems requirement reviews and coordinated with the customer, functional representatives, and technical personnel to clarify requirements for maintenance inspections. Monitored all outgoing and incoming correspondence; delivered all correspondence to applicable recipients. Led 6 coworkers in the conversion of paper to electronic records for 960 maintenance equipment, completing project 4 months ahead of schedule. Responsible for project data management and effectively translating business needs/processes for increased efficiency and effectiveness into operation. Efforts resulted in the reduction of invalid data and error free. Developed queries and reports to provide management with updated information of equipment conditions, utilization, workload, employee utilization, and failure trend. 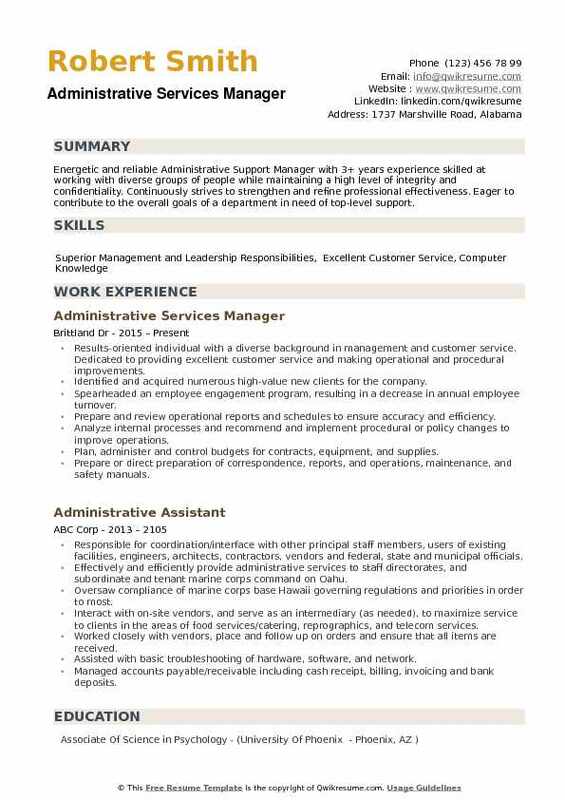 Summary : To obtain a position as an administrative assistant, or Manager, that will utilize my strong dedication to customer service and exceed customer expectations. Task-oriented, and will excel in a solitary or team environment. Supervise clerical staff to ensure administrative tasks are completed in a timely manner; complete performance reviews on administrative staff. Backfill for front desk frequently; answer, and direct telephone calls. Complete clerical duties, letters, memos, purchase requisitions, etc. Submit emails to helpdesk and/or call it hotline for office computer issues. Distribute building entry access cards and security code as provided by facilities director. Create a document with the list of employees with access cards. Notify facilities of lost cards for replacement. Monitor office supplies to ensure they are replenished in a timely fashion each month. Keep office staff apprised of building issues, heating, air conditioning, housekeeping, etc. Maintain keys to offices in the event of an emergency, such as lost office keys, etc. Disperse petty cash to office staff for emergency purchases, training materials. Type and submit petty cash reimbursement receipts to accounting. Advise staff on building issues concerning inclement weather via email/voicemail. Responsible to ensure vehicle check-ups and vehicle issues as they arise. 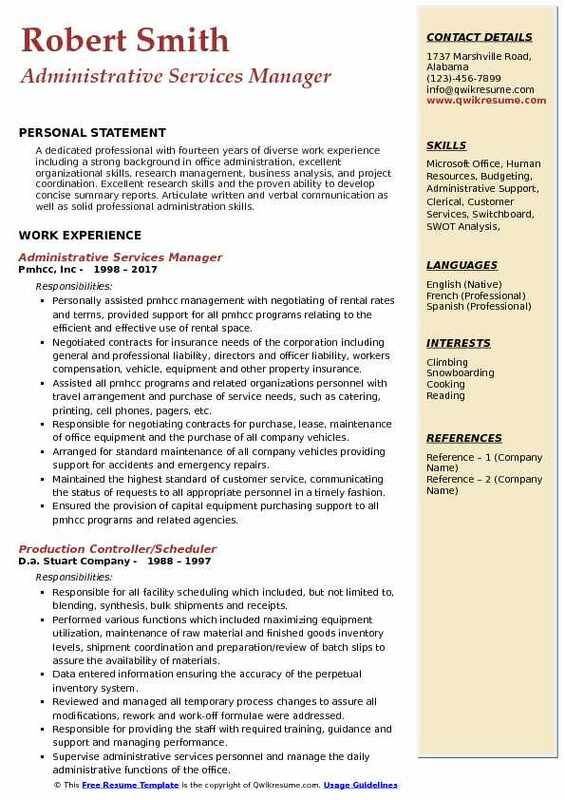 Summary : A dedicated professional with fourteen years of diverse work experience including a strong background in office administration, excellent organizational skills, research management, business analysis, and project coordination. Excellent research skills and the proven ability to develop concise summary reports. Articulate written and verbal communication as well as solid professional administration skills. Personally assisted pmhcc management with negotiating of rental rates and terms, provided support for all pmhcc programs relating to the efficient and effective use of rental space. Negotiated contracts for insurance needs of the corporation including general and professional liability, directors and officer liability, workers compensation, vehicle, equipment and other property insurance. Assisted all pmhcc programs and related organizations personnel with travel arrangement and purchase of service needs, such as catering, printing, cell phones, pagers, etc. Responsible for negotiating contracts for purchase, lease, maintenance of office equipment and the purchase of all company vehicles. Arranged for standard maintenance of all company vehicles providing support for accidents and emergency repairs. Maintained the highest standard of customer service, communicating the status of requests to all appropriate personnel in a timely fashion. Ensured the provision of capital equipment purchasing support to all pmhcc programs and related agencies. 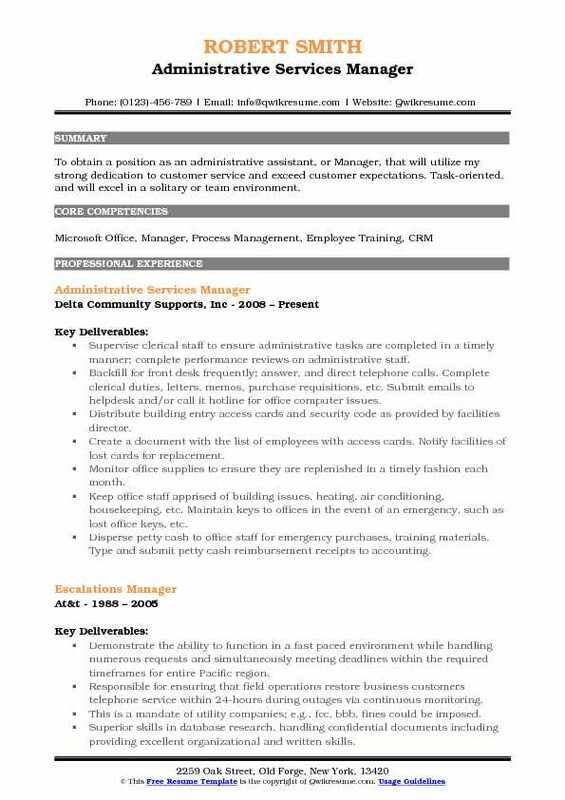 Handled a variety of functions such as supervising the purchasing assistant, liaison with security system companies, maintaining relevant assigned property databases and obtaining parking spaces for company/employee vehicles as necessary. Objective : Energetic and reliable Administrative Support Manager with 3+ years experience skilled at working with diverse groups of people while maintaining a high level of integrity and confidentiality. Continuously strives to strengthen and refine professional effectiveness. Eager to contribute to the overall goals of a department in need of top-level support. Results-oriented individual with a diverse background in management and customer service. Dedicated to providing excellent customer service and making operational and procedural improvements. Identified and acquired numerous high-value new clients for the company. Plan, administer and control budgets for contracts, equipment, and supplies.